Great car but could use some refinements for cold weather and low light conditions. Touch screens do not respond well to gloved fingers. Heated steering wheel would help a lot. 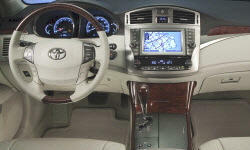 Why the 2011 Toyota Avalon? Heated seats are wonderful in winter. Dual zone heater/air conditioner a plus for driver/passenger comfort. Back-up camera is handy for checking what the mirrors don't pick up. Quiet, smooth engine/transmission. Comfortable seats are easily adjustable. Easy access and good leg-room in rear seats. 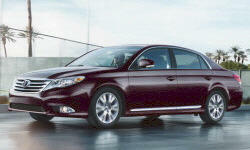 Why Not the 2011 Toyota Avalon? My previous Avalon was a 2002. It had a more visible compartment for sunglasses. The latch mechanism was also better because it did not allow the closing mechanism to jam on the glasses. The 2011 model closures on the dash compartment (center) and the cupholders seem brittle and prone to latch breakage. On my 2002 there were two sets of sun visors. This was a great feature for times when the sun is at a low angle (several months here in Canada) and you need a visor at the side and in front. The 2011 model has only oneand this can cause problems at commuting times or when going up hills. A car with a black interior should have the dash and overhead switches in a light color so that they are easy to locate in low light conditions.